Additional reporting by Joe Linton. Photo by Brian Addison. Graphic below courtesy of Metro. I’ve railed against the 710 expansion project because, in all sincerity, it’s not only ridiculous but archaic form of infrastructure. Even with two committees, largely comprised of Board members, not moving forward yesterday with recommending that the expansion project move forward with option 5C as is—adding two lanes in each direction—it still looks like Long Beach and the other communities along the freeway will be dealing with and paying for a $6B expansion project that will cause more congestion, more pollution, and less solutions for smarter transit in Southern California. Metro staff had hoped that their proclamation of Alternative 5C as the “locally preferred alternative” would influence the decisions of the committees—despite a no-build option being viable and an exorbitant $11B alternative that would create an elevated, four-lane, clean emissions freight way being financially unattainable. Change the Zero Emission/Near Zero Emission truck technology development program to focus solely on entire Zero Emission technology. Increase program funding amount from $100M to $200M, and include in the Program incentives and grants to invest in the acceleration of zero emission technology both for long hauling trucks and for freeway infrastructure, including “under the pavement” vehicle charging capacity and dedicated Zero Emissions lanes, one each way. Convene a working group comprised of the California Air Resources Board, South Coast Air Quality Management District, California Transportation Commission, the Ports of Los Angeles and Long Beach, and other key stakeholders to develop a policy recommendation for a full, zero-emission only, dedicated lane including “rechargeable roadways” on the entire 19 mile long stretch of 710 freeway, and include this as part of the final EIR/EIS document, presented in the September 2019 Metro board cycle. The only issue? The actual hope of a true zero emission corridor here is a false one—and the recommendation from Hahn is likely one that allows the project to move forward while saving grace with the environmentalists. The ultimate point is that they still want to expand the freeway, one which will destroy 400 homes, and are still claiming that expanding freeways ease congestion—when the precise opposite is true. 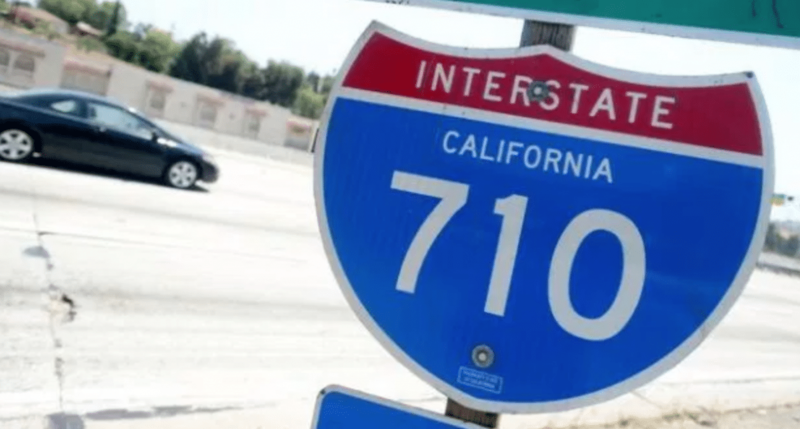 Between Measure R and Measure M, Metro has just over a billion dollars for the lower 710. If the 55% cost overrun on Metro and Caltrans’ $1.6B 405 Freeway widening project is any indication, the lower 710 Freeway widening could easily balloon well over its projected $6B. But it hasn’t been just me screaming at the asphalt. “It is difficult to believe that, in the 21st Century, Caltrans and Metro are still seeking to spend billions widening a highway in order ‘to improve air quality, mobility, and quality of life’ per the Metro project website,” wrote Streetsblog LA editor Joe Linton earlier this week. But let’s just be frank here: it is not too late for the Metro board to pull the plug on the unfunded multi-billion dollar lower 710 Freeway widening—and the supposed benefits that Metro is linking with the project could be achieved without widening the freeway at all. In the words of Lopez, “mandatory zero emissions lanes, more robust public transit, bike and pedestrian facilities, a commitment to put local people to work, and not displacing homes, facilities that support the homeless, and other vital resources” can all be achieved with the billion dollars already at hand and—repeat—without screwing over countless communities that have already been plagued by having the 710 run through them.